Loss of ERCC1 results in increased type I IFN and cytokine signaling in NSCLC models in vitro. (A) Schematic of the generation of ERCC1-deficient clones from the parental NSCLC cell line A549. Full procedures are detailed in Friboulet et al. (31). (B) Western blot showing expression of ERCC1 in the parental (ERCC1WT/WT), heterozygous (ERCC1+/–), and ERCC1-knockout clones (c216, c295, and c375). 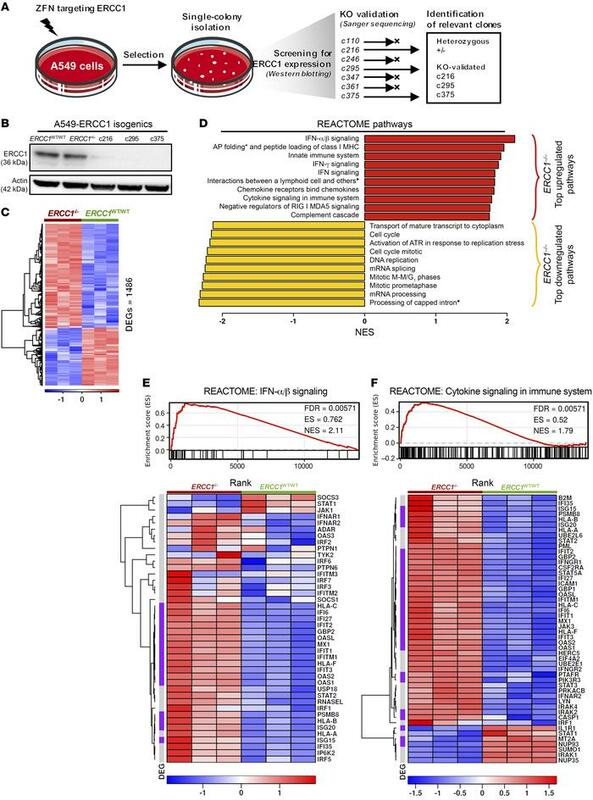 (C) Heatmap displaying all significantly differentially expressed genes (significantly DEGs) in A549-ERCC1–/– cells compared with A549-ERCC1WT/WT cells, determined by RNA-Seq. n = 3; heatmap scale is a Z score. Threshold for differential expression was |LFC| > 1, and threshold for significance was FDR < 0.05. (D) GSEA of REACTOME pathways in A549-ERCC1–/– compared with A549-ERCC1WT/WT cells. Red, top 10 upregulated REACTOME pathways in A549-ERCC1–/– cells; yellow, top 10 downregulated REACTOME pathways in A549-ERCC1–/– cells. All pathways displayed had FDR < 0.05. AP folding*, antigen presentation folding assembly; Processing of capped intron*, processing of capped intron containing pre-mRNA; Interactions between a lymphoid cell and others*, interaction between a lymphoid cell and non-lymphoid cells. (E) GSEA of the REACTOME pathway “IFN-α/β signaling,” and associated heatmap showing the genes of the pathway, ranked by FDR. n = 3; heatmap scale is a Z score. (F) GSEA of the REACTOME pathway “Cytokine signaling in immune system,” and associated heatmap showing the genes of the pathway, ranked by FDR. n = 3; heatmap scale is a Z score. In E and F, purple, significantly DEGs with FDR < 0.05 and |LFC| > 1; gray, nonsignificantly DEGs.